Mastrio Web Page » The Archive » Now that HURTS! You know when it’s a potentially bad morning when your kid runs upstairs screaming “mommy hurt herself and is on the couch!!!”. It sends a chill up your spine for sure… especially when Eileen said she was going for a bike ride this morning! Well, come to find out, Eileen did have an accident this morning… thankfully she didn’t get as hurt as she might have! She got up a bit early and decided to get in a quick bike ride, her usual 12 mile ride around Wilbraham. She got to the intersection of Stoney Hill Road and Tinkham and some kid stalled out in front of her or cut her off (or both) and caused Eileen to slam on her brakes – when she did she went over the front of the bike and crashed shoulder-first into the road! 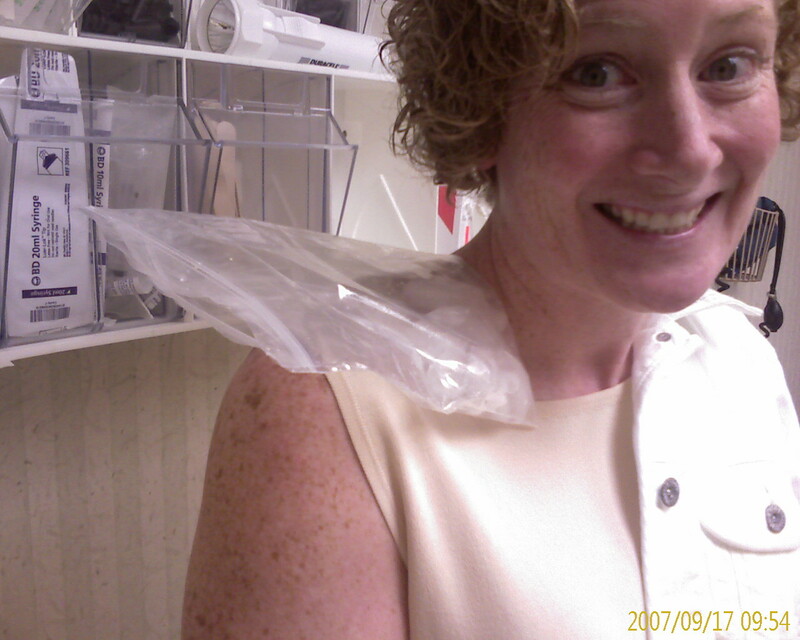 As you can see from the picture, she still had ice on the shoulder at 10am when we got word from the clinic that nothing was broken but she did so some to some unpronounceable part of her shoulder… unpronounceable to me at least ;). Now I’m stuck doing the yard work we had planned – accident? I think not! I’m happy that I got that super expensive helmet, because I’d take a shoulder injury and a few scrapes over a head injury any day! The first thing that hit was her head and the helmet absorbed the entire blow… REMEMBER KIDS ALWAYS WEAR YOUR HELMET!!!! We’ll have to see about how long she’ll have to wear a sling, so I guess no javelin throwing or bowling for a few weeks! Holy smokes, thank GOD she’s OK. How scary was THAT? It’s still hard to believe that with all the miles I’ve put in I still never did a header on the pavement. Plenty of them in the woods, but never in traffic. Wow, very scary. Thank goodness for helmets. Ride safe Eileen!